Dave McCoy – 99 YEARS OLD! Friday, August 22 – Birthdays & Anniversaries! Date of Event: August 21, 2014 at 12:35pm. Type of Event: 278.5 PC- Child Abduction/Violation of a custody order. Location: US Highway 95 near the Walker Lake area. Suspect: SCHAT, Angel Jacoba. 43 year old female, Bishop Resident. On Thursday, August 21 at 12:35pm, the Bishop Police Department received a request from Sean Singleton for a welfare check on his 4 year old son living in Bishop. Singleton also told police the mother might be in the Reno Nevada area, and he believed she might be trying to leave the state. The residence in Bishop where the mother and child were believed to be at was checked; it was determined no one was at the residence, and it appeared to be vacant. Bishop Police immediately distributed a “Be on the lookout” with local agencies; all counties within California, as well as neighboring states. Further information was gathered regarding SCHAT, and it was determined the child may be in danger while in the care of his mother and she was not allowed to take the child out of Inyo County. With assistance from the California Highway Patrol, the Bishop Police Department issued an AMBER Alert for the blue 2001 Chevy Silverado driven by SCHAT, Angel Jacoba. Information was sent nationwide regarding the child abduction. The National Center for Missing and Exploited Children was also notified. At 5:21pm, we received information that SCHAT might be at the Reno/Tahoe International Airport in Reno Nevada. Video surveillance showed SCHAT, and the 4 year old child leaving the airport in the blue Chevy Silverado in an unknown direction of travel. At 7:34pm; the Chevy Silverado was possibly seen in Lee Vining, California; but the vehicle was never located. At 8:40pm, the Bishop Police Department received notification that SCHAT had been located on US Highway 95 around the Walker Lake area. Mineral County Nevada Deputies received a 911 call from a subject who was behind the Chevy Silverado and deputies were able to stop the vehicle. SCHAT; reportedly resisted arrest and deputies had to use force to subdue her. A plastic toy handgun was also located inside the vehicle. SCHAT, Angel Jacoba was arrested on child abduction charges as well as possible new charges with Mineral County Nevada. The 4 year old was unharmed and was taken into protective custody. SCHAT will be extradited back to Bishop as soon as possible and will be charged with 278.5 PC- Child Abduction/Violation of a custody order and 273(a) PC-Child Endangerment. The Inyo County District Attorney’s office announced today that Bishop-area resident Rebecca Bragdon has entered pleas of “guilty” to misappropriation of public funds from the Tri-County Fairgrounds. The pleas arose from charges that she embezzled funds from the Fairgrounds when she was employed as an office manager from July 2012 through July 2013. The matter was originally investigated by the Inland Division of the California Highway Patrol. Ms. Bragdon plead guilty to violating Penal Code section 424, commonly known as misappropriation of public funds, and Penal Code section 470, commonly known as forgery. Both charges are felonies. Restitution was also set in the case at $25,979.82. Sentencing has been set for October 22, 2014. Under the terms of an agreed disposition, Ms. Bragdon may be ordered to serve up to one year in the Inyo County Jail and will be placed on five years of formal probation. Probation terms will include requirements that she pay restitution and be subject to search for stolen property, as well as any other terms as may be deemed appropriate by the sentencing court. By entering the pleas, she will also be barred from holding any public office. The term of incarceration will be determined by the court at the time of sentencing. Any questions or requests for further information can be directed to District Attorney Tom Hardy at 760.878.0282 or 760.873.6657. On August 25 and 26, Inyo County Public Works (ICPW) will be participating in a series of public meetings to present the details of the Bishop Airport Layout Plan (ALP) to interested community members. The Bishop ALP builds upon the 2004 Bishop Airport Master Plan, prioritizing several key infrastructure improvements and upgrades discussed in the Master Plan. Earlier in July, Clint Quilter, ICPW Director, discussed the potential availability of federal and state funding to develop and implement the ALP at both the Northern Inyo Airport Advisory Committee and Board of Supervisors meetings. Recently, ICPW has been presenting details of the ALP to elected officials, community service providers, and other local leaders, and is now excited to offer a multimedia presentation with details of the ALP and host question and answer and open comment sessions at three public forums. On Monday evening at the Bishop City Hall starting at 7 pm; on Tuesday at the Board of Supervisors meeting in Independence at 11:30 am; and on Tuesday evening at 5:30 pm at the Sierra Life Flight Hangar at the Bishop Airport, ICPW and Wadell Engineering Corporation, the expert airport consultant in charge of developing the ALP, will make a 20 minute presentation with slides and photos. Afterwards, the public is welcome to ask questions, express support, and/or raise potential concerns. The Bishop Airport is a vital part of the community that receives daily flights, both public and private. Originally constructed in 1929, the airport currently has flights delivering express goods and mail, flights for emergency medical situations, firefighting flights, and private flights for pleasure, business travelers and airplane aficionados. Today, 10 years after the Board of Supervisors adoption of the Bishop Airport Master Plan, the Bishop Airport is in need of critical, safety-related infrastructure improvements. In April of 2011, years of hard work between Inyo County and the Los Angeles Department of Water and Power (LADWP) came to fruition with the County obtaining an easement in perpetuity for all airport related use at the Bishop Airport from the City of Los Angeles. The easement gave Inyo County property rights and permission to handle all improvements and upgrades at the airport and, in turn, paved the way for the County to apply for Federal Aviation Administration (FAA) grant funding to implement the strategies laid out in the 2004 Bishop Airport Master Plan. Thursday, August 21st: Happy Birthday and Anniversary, Listeners! On the afternoon of Thursday, August 14th, 2014, at approximately 2:00pm, Mono County Sheriff’s Dispatch received a call regarding an injured hiker at Arrowhead Lake. A 32-year old female hiked to Arrowhead Lake were she sustained a leg fracture by striking a tree while swinging from a rope over the lake. Due to her leg fracture, she was unable to hike out. The Mono County Sheriff’s Search and Rescue (SAR) team was called to aid the injured hiker. 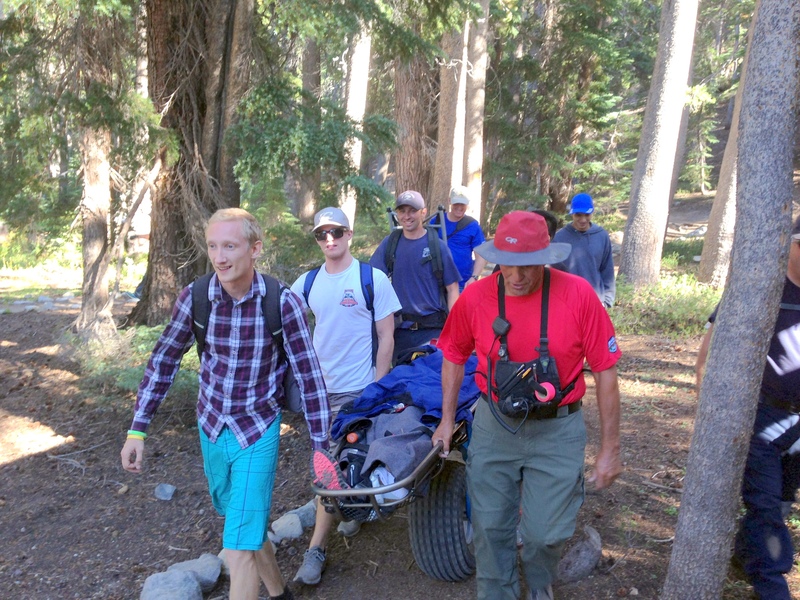 Members from the SAR team, and personnel from Mono County Paramedics and the Mammoth Lakes Fire Department, hiked to her location, stabilized the fracture and transported her one and a half miles, using a wheeled litter, to the ambulance at the trailhead. The rescuers were also assisted in the carryout by a group of cross-country runners from California State University San Marcos. The injured hiker was transported via ambulance to Mammoth Hospital for further treatment. § 6:00-8:00pm – Thursday, September 18, Tri-County Fairgrounds, Sierra Street & Fair Drive, Bishop, CA. Meetings are also scheduled for the Sierra and Sequoia National Forests. The NOI will advise the public of the Forest Service’s intent to prepare and develop an environmental impact statement (EIS) that, when completed, will revise forest plans for the Inyo, Sequoia and Sierra National Forests. The NOI will also have information on the purpose and need for this action along with the agency’s proposed action. The final EIS will result in three separate Records of Decision and three separate forest plans. Forest Supervisors will remain the “responsible official” for making decisions on their specific forest plans. The Sierra, Sequoia and Inyo are three of eight national forests that were selected as “early adopters,” meaning they will be the first forests to revise their land management plans using the new National Forest System Planning Rule, which was completed in 2012. The planning rule provides the framework for Forest Service land management plans across the nation. Next month’s public meetings are part of the “scoping period” which gives the public a chance to tell the Forest Service what issues and concerns they think should be addressed in the EIS before the Forest Service begins drafting the document, and to provide written public comment regarding the NOI’s purpose and need, and its proposed action. For more information regarding forest plan revisions, visit the Pacific Southwest Region’s planning website at:www.fs.usda.gov/main/r5/landmanagement/planning. AMERICANS WITH DISABILITIES: In compliance with the Americans with Disabilities Act, if special assistance to participate in this meeting is needed, please contact the appropriate National Forest. Notification at least 48 hours prior to the meeting will enable the Forest Service to make reasonable arrangements.